This is a 2 CD package. Each CD has it’s own seperate “case” inside the larger packaging. There is a somewhat large liner notes booklet – far larger than what would normally fit inside a jewel case. The remastering work on this product was culled from the larger remastering project that resulted in the 2004 release, “Black Box”, as well as the 2006 single disc “Greatest Hits” release. This is a picture of a record store promo item that was out when this compilation was new. 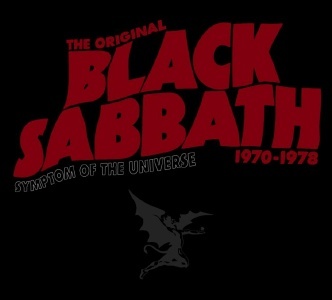 A week or so ago, the new 2 CD “The Original Black Sabbath 1970-1978: Symptom of the Universe” package was released. 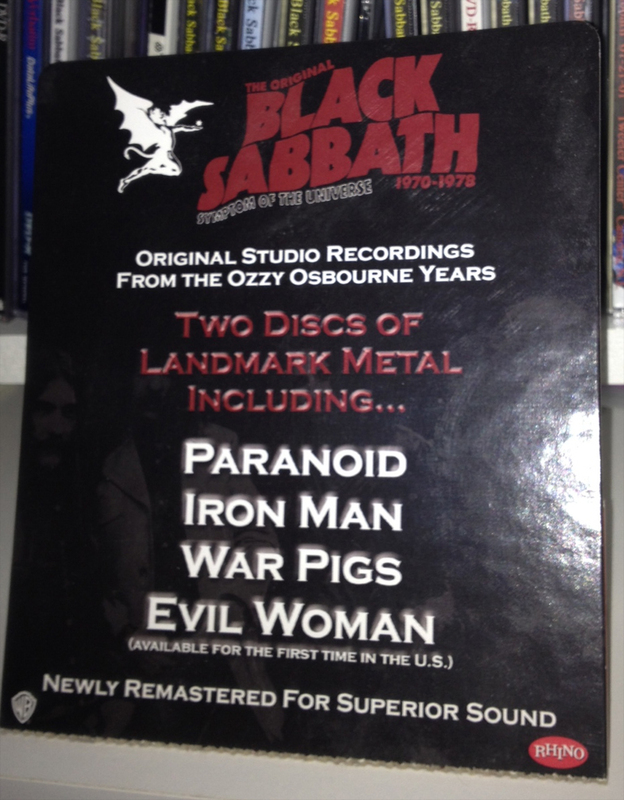 When I first heard about it, my thought was “Big deal – yet another packaging of the same old Iron Man / Paranoid / War Pigs collection – who needs that?” BOY WAS I WRONG. Normally I don’t like packages like this, because it strikes me as an attempt to get folks to just buy the same songs again. However, this time it’s most definitely worth it. This isn’t just a standard repackage. This set does have the songs that we know well, but these are a new remastering of the songs. This has nothing to do with the 1996 Castle Communications remaster of the albums from 1970-1987. These are NEW remasters taken from the original Warner Bros Master tapes (indeed, this bears the Warner Bros logo as well as the Rhino one). In fact, I was informed this week that the 96 Castle remasters were not “authorized” by the band – it was one of those record label things. It’s not like they’re illegal or something, but not a “band sponsored” item. Anyway, the fidelity on these is quite quite spectacular. I’ve been listening to Sabbath since 1981, so I’m familiar with the songs, and I have to say, I’ve heard some bits on here that I’ve never heard before. They’re quite astonishing. I’m not normally one to recommend a package such as this, but I can wholeheartedly recommend this package – even if you own the Castle remasters. Also, while I’ve not been given any formal information stating as such, one can speculate that since the songs have been remastered again from the Warner masters, you have to wonder if a reissue of the albums themselves are on the books? I don’t have any info that says they will, but if so, I’ll be sure to pass it on. If the studio albums are remastered and re-released again in the same method that this is, it might very well be worth it to pick ’em up again! And that’s just the songs. The packaging itself is quite good, too. There’s two individual sleeves for each CD, as well as a booklet. This isn’t standard jewel case packaging. And this thing is loaded, and I mean LOADED, and I mean loaded with pictures I have never seen before. I’ve been involved with Sabbath as a fan for a long time, and I’ve read numerous interviews, and seen tons of photos. Now, I do not claim to know everything about Sabbath – I’m not that foolish or naieve. However, over time, you tend to hear the same stories, and see the same promo photos. I have to say – about 90% of the photos in here I have never seen before. Some are quite QUITE awesome. I have to say, I cannot speak more highly about this package. I got mine free as a comp from the record label as part of the group that I’m giving away next week in a contest, but even if I didn’t, I would happily buy this – it’s quite good. If you want to buy it yourself, click on the cover art here with the story. Major kudos to all involved in putting this together – and let’s hope the apply the same quality treatment to the Ozzy era studio albums should they too be remastered and re-released! Would you say these sound as good or better than the Castle remasters from around 1996? More greatest hits! No new album like promised, just more greatest hits! This flux period of the band sucked.